Expro is a leading global provider of well intervention services. 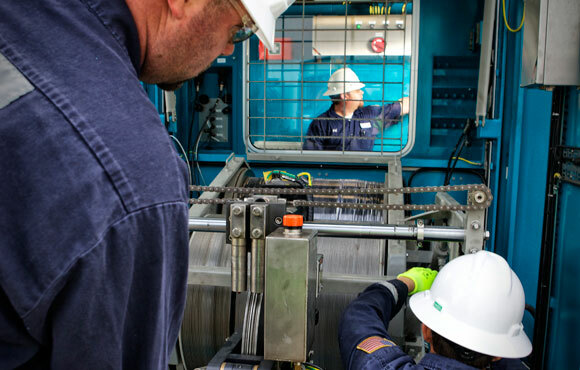 We are the world’s largest independent wireline service company, employing more than 1000 specialists globally, performing over 12,000 wireline runs every month. Expro’s experience, technical excellence and innovation allows us to deliver tailor-made solutions to meet our customers’ well data needs - providing the enhanced data they need, when they need it. Expro provides multi-functional deployment equipment for rapid deployment on land, platform and deepwater subsea conditions globally. Expro offers an extensive range of slickline services with innovative equipment, together with highly trained competent experts. We provide every slickline capability from basic completion intervention applications to advanced services. In addition to standard 108” slickline, we also provide 125” and 160” slickline which gives performance capabilities similar to braided cable. Expro can also accommodate customer requirements in relation to pressure control equipment ranging from 3” to 7 5/8” and from 5K psi to 15K psi. Utilising experienced fishing supervisors and heavy duty fishing units, Expro provides the complete range of tool sets. This includes spring jars, hydro mechanical jars, accelerators and specialised fishing tools for any application. Where cable is stuck in hole our sandline cutter can be utilised to cut cables in size up to 1/8” in diameter, even in highly deviated wells. Our downhole video camera technology can be used to assist in fishing operations and minimise costly operations. Electric line services are available to help you understand and optimise your well and reservoir production. Whether you need perforating, production logging, or well integrity evaluation, our comprehensive cased hole services ensure your wells will continue to reach their full production potential.